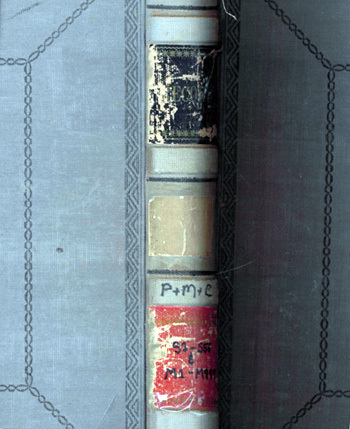 Top: Cover of one of the USGS Menlo Park ledgers. Bottom: Ledger entry for USGS locality M26. One of the collectors is Charles Warren Merriam, who received his Ph.D. from UC Berkeley in 1932, worked for the USGS Menlo Park office and is the son of John C. Merriam, an important figure in the early history of UCMP. Also see this page on UCMP history. Photos by the UCMP Invertebrate Collection crew. Good progress continues on the UCMP project to rehouse and digitally image the former USGS Menlo Park invertebrate collection. We have rehoused the Mesozoic portion of the former Menlo Park collection, which now fills 17 of the 60 metal cabinets purchased for this project. This spring the undergraduate students working on the project finished scanning all of the USGS locality ledgers that accompanied the collection. Historically, as USGS locality numbers were assigned, they were recorded in the hardbound ledger books. The ledgers include entries for over 8000 Cenozoic localities and 7500 Mesozoic localities. Each entry includes a site description, the collector, the date of collection and a field number. In some cases, corrections were made to the original entry that may not be reflected in typed locality cards or later electronic databases UCMP received. Some ledger entries were incomplete, with penciled notes to contact the project paleontologists such as George Kennedy and William Elder. We have been in contact with these scientists, who were able to check their field notebooks and provide information on these localities. A special thanks to undergraduate students Gina Hwang, Dianne Quiroz, Michelle Sparnicht, Monica Theibault, Olivia Tullier, and Alexis Williams, Anne Zavala for their patience in completing this monumental scanning task! This summer will be a busy one at UCMP's off campus collections facility! Four undergraduates will continue with the major goal of rehousing the Cenozoic collection. Additionally, two graduate students are hired to upload the remaining localities into the UCMP database and design an educational module based on the locality records and photos we are producing. We look forward to sharing these continuing project goals and accomplishments with you!